Feeling inspired by Mondays' Must-have, today's outfit post features my go-to Breton stripe top. I mentioned how versatile the Breton was and I wear this one all year round as it's a thin knit so perfect for those cooler summer days and layered with a shirt in the winter months. Another style favourite set to stick around for A/W14 are culottes; I myself thought it would be one trend I wouldn't give in to (along with flares). However they are surprisingly flattering on so many body shapes and have the feminine look of a skirt with the added practicality of shorts. So when I spotted this vintage pair, in white, for only £8 I had to at least try them on and they fit like a dream! I urge you to give them a try next time you're browsing the stores, definitely one of those "looks better on" pieces. Like myself, you can ease into the trend with a shorter version of the culotte before you brave the all-out, go hard or go home SS14 Proenza Schouler pants. Culotte shorts still look chic with flats, but I'd stick to heels if you're reaching for midi-maxi lengths. To polish the look off and steer slightly away from that french sailor costume I was narrowly heading towards, I threw on my fav tangerine duster coat and went for minimal black accessories. I'd been looking for a barely-there sandal with a (easy to walk in) thick heel for a while and the babes at Public Desire came through with these sleek beauties with gold metal hardware ankle cuffs. 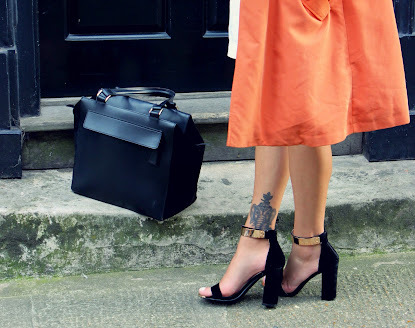 If you haven't yet heard about the shoe-heaven website here, then you've been missing out on some serious bargains! Grab further discount until 13/08/14 with code "Vee10"
Absolutely love this look, you look incredible. i am obsessed with culottes right now. love the length of yours and the autumn color scheme going on. Same! Think the next Monday must-have will need to be culottes!!! i keep that look on my inspiration folder. Love it! !